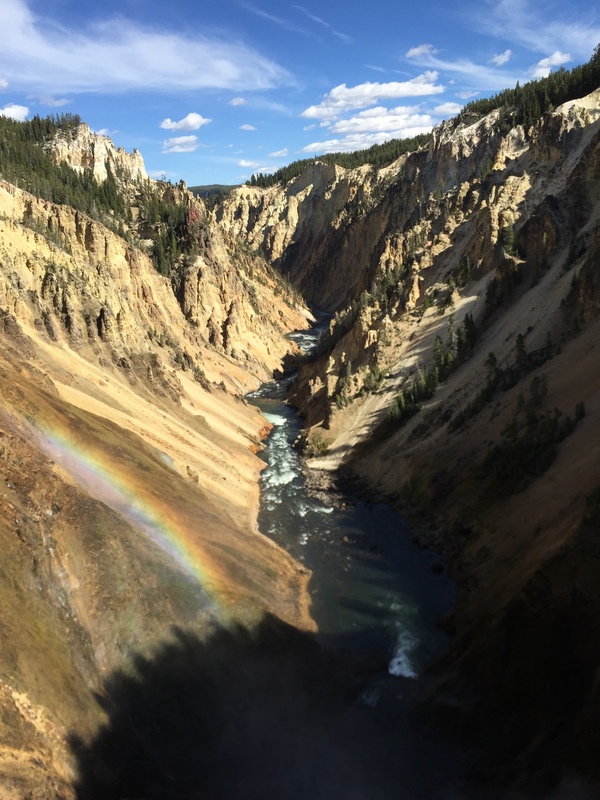 Yellowstone National Park was a must see for my boyfriend and me as we road tripped our way back from Seattle to Cleveland. It’s pretty touristy, but with good reason – the diversity of life that furls and unfurls before your eyes is astounding. Immediately upon entering Yellowstone, we were welcomed by a particularly slow moving traffic jam due to a Bison moseying down the road. And in the left lane – the nerve! I got a great shot of him nodding his head, apparently completely unphased by the cars passing him. 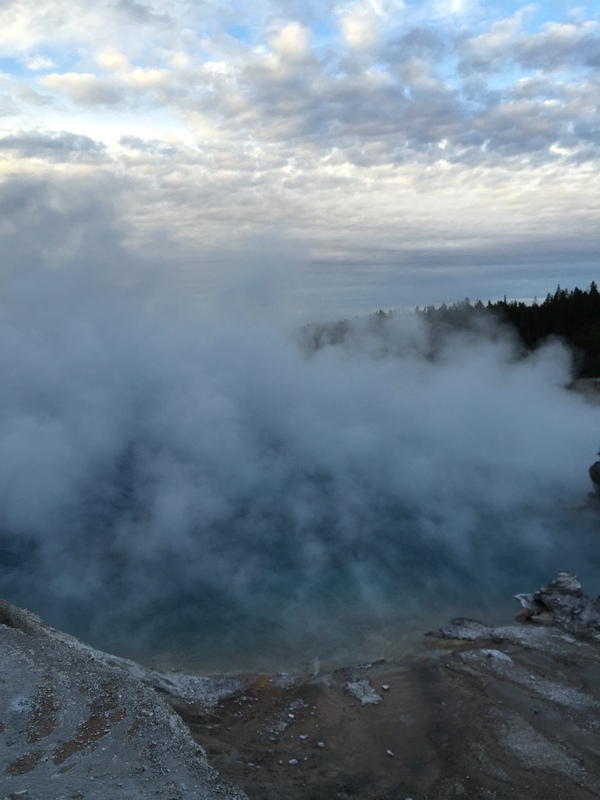 Our first stop in the park was Norris Geyser Basin. There were two basins total, but we only walked the entirety of one: the Porcelain Basin, named for it’s smooth, white thermal surfaces that have been shaped over time by acidic, boiling water. Pools of crystal blue, burnt orange, and algae green water were boiling in the ground all around us. Apparently you can tell the temperature by the color of the surface – green means the water is around 100-113°F and orange indicates temperatures between 120-140°F. 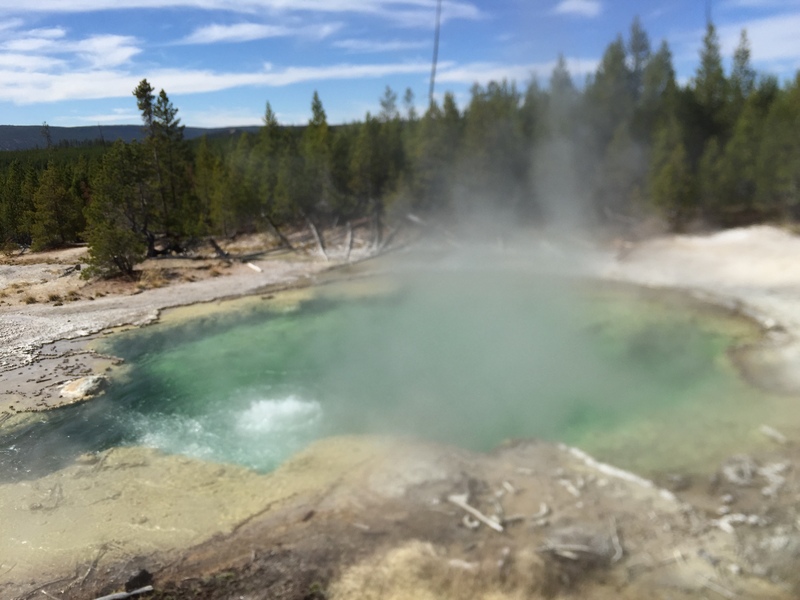 We were able to see the Whirligig Geyser erupt, but my favorite was the bubbling mud. Of course you can’t leave the path or you risk getting scalded to death. Regardless, everything about the basin was new to me and truly amazing (Aside from the smell of sulfur. Sulfur is beautiful but stanky). It was surreal to see tiny streams trickle past that looked so very gentle, and know that they could kill you. As a Pisces and someone who has always felt a strong pull towards water, a quiet, reckless part of myself whispered a desire for the double demise of it, being consumed and boiled alive, entirely ended. 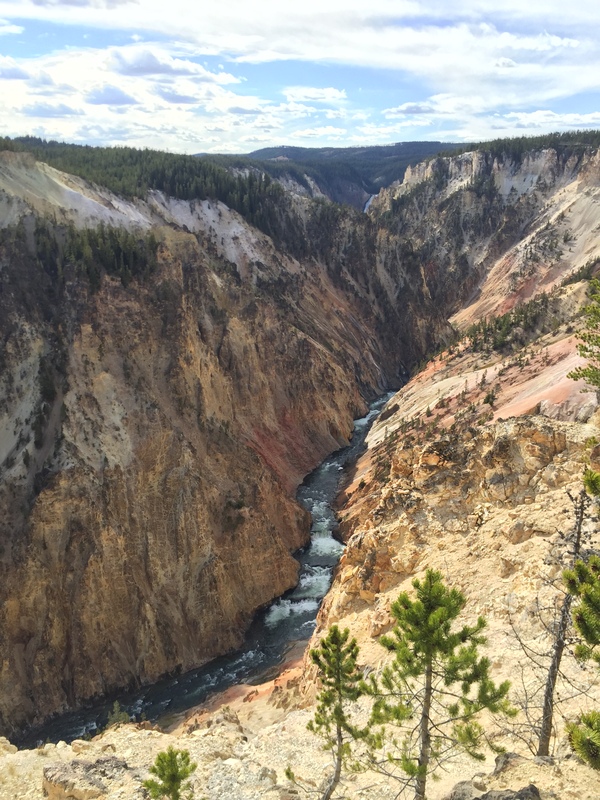 Our second stop was in the Grand Canyon of Yellowstone, where we took the lower trail to view one of the canyon’s waterfalls from the top. After 10 switchbacks of trails that took us 600 feet into the canyon, we still weren’t halfway down it. The canyons rose up on other side of us like jagged yellow giants, and echoing around us was the constant, soothing rush of the falls and river below. We were lucky to be there on a clear beautiful day so that we could view the endless rainbow protruding from the falls’ base. We continued on around Canyon Village, stopping at viewing spots with cute names like Inspiration Lookout, where a 73-year-old British woman and self-proclaimed daredevil helped us hop the gate that led to the edge of the cliff, which was closed off for repairs. So we hopped over with her and stood there a while, just looking out, occasionally making mouth noises to simulate the sounds of what it might be like to fall off various cliffs of the canyon. The next stop, Hayden Valley, was perhaps the most exciting. At least my heart was racing when a buffalo only 15 yards away decided it didn’t like me sitting on the side of the road watching it and charged in my direction. 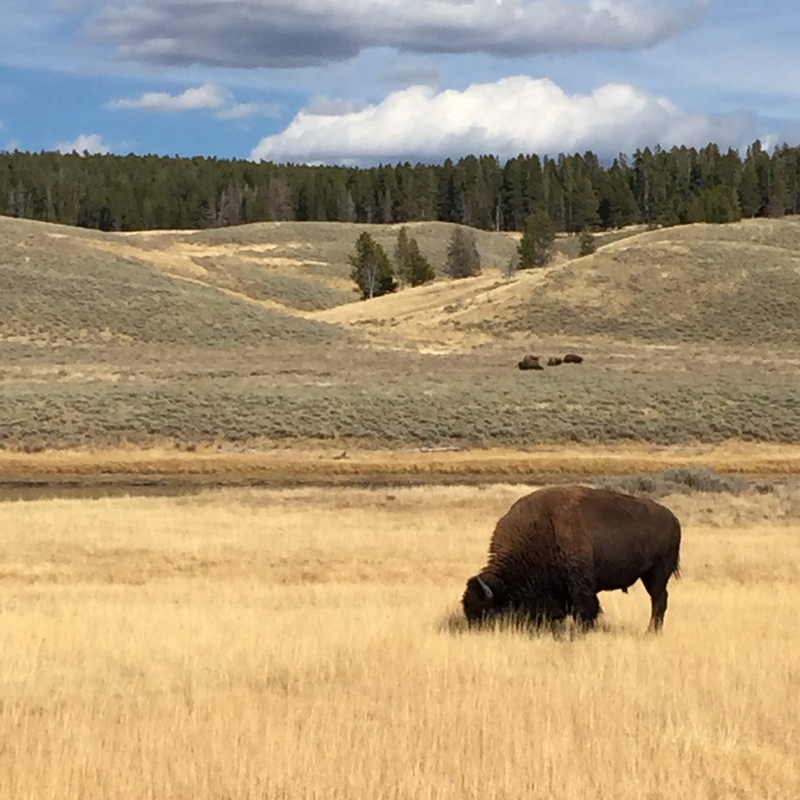 Don’t worry, I hopped in our car right behind me and the bison chilled out pretty quickly. As for me, no comment. Hayden Valley, which I just kept calling Hidden Valley because it was sort of tucked away, is popular in Yellowstone because it’s known to be filled with wildlife. Seeing any large, uncommonly seen animal in its wild habitat is an eye-opening experience no matter what animal you’re watching. It felt the same way seeing bears in Alaska. There are no fences, and there is only a board of simple directions should you encounter the animal face to face, but no guarantees. “People have died,” the Yellowstone signs read. This is their habitat and you are imposing on it (more so than usual), so be a good guest. Though it wasn’t in our “itinerary” we decided to stop on a path to the Churning Cauldron, Black Cauldron, and Dragon’s Mouth. Dragon’s Mouth – a hot spring cave with steam coming out that roared and made waves on the small pool of iron-sulfuric water as though a dragon was lurking just beyond the darkness. The waves were sporadic and occasionally boiling water spat into the air. It made me realize how eerie the entire experience of water in Yellowstone really is. Yellowstone sits on top of an active volcano, and cooling molten lava heats rock, which heats mud and water that each react in a different way to cause the varying effects we see above ground: geysers, hot springs, boiling mud pools, colorful sulfuric streams, and acidic valleys. When you hear a stream or a waterfall, images in your mind are ones of cool, refreshing currents. It might even make you feel like swimming. 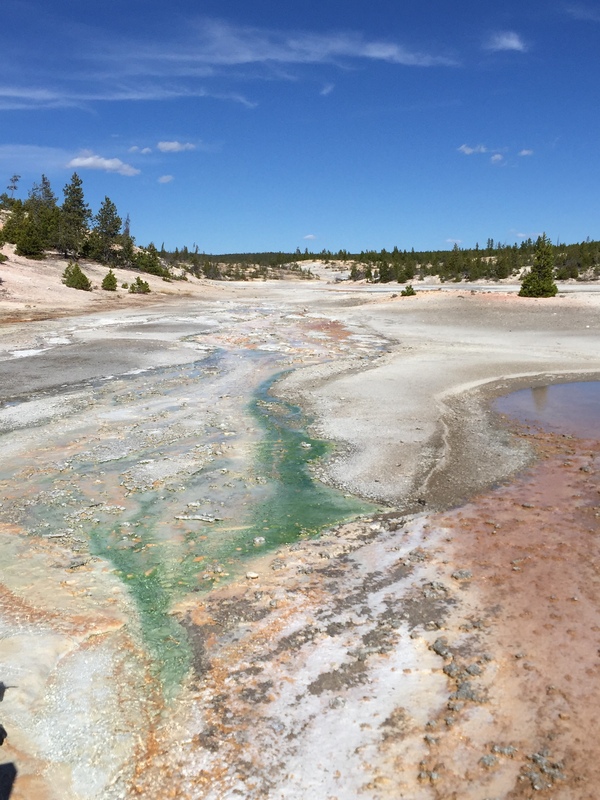 But the knowledge of Yellowstone’s water’s temperatures added lethal undertones to those sounds throughout the park. Waterfalls had geysers spouting steam along the sides of their basins. It was a little unsettling, but thrilling. The spookiest and also most beautiful area of the park was Grand Prismatic Spring, a brightly colored pool of steaming hot water that, unlike the basin, geysers, and “cauldrons,” made absolutely no sound. In fact it seemed to mute the air around it, reminding me of the deadly poisonous fog from the second Hunger Games: Catching Fire. All around the lake, and all around you as you head out into the giant boardwalk loop are steaming hot, colorful puddles walled off from each other by thin lines of cooling volcanic rock. Pools in the area are so thick with steam that rolls over you soundlessly, heating and moistening the air you breath (and your camera lens). There is a nearby river of cooler water that the hot streams pour into, but any noise of it is silenced when you’re within the steam plume only a dozen yards away. I felt an obvious outsider in this foreign, alluring landscape. We ended the evening by catching the last Old Faithful geyser eruption that would see sunlight. It lasted a good two minutes and was exactly on time. The geyser shot a heavy gush of water over 100 feet into the air, all of which dissipated into steam before ever touching the ground. Amazing. 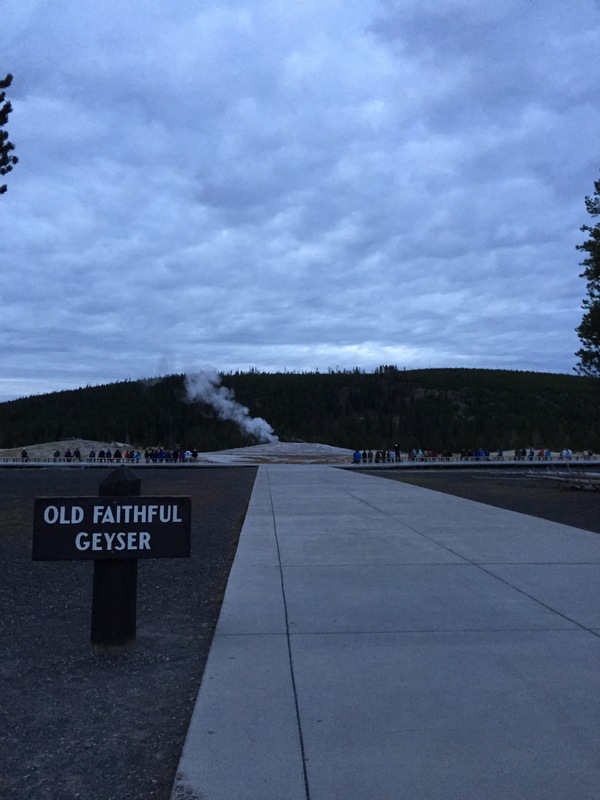 Giving cheers to Old Faithful’s reliable timeliness was the perfect way to end our perfect day in Yellowstone. On the drive out of the park, we decided to fill some of the extra time we have ahead on our way into Utah to make a stop at Jackson Hole. Because what’s a road trip without a little unexpected adventure? I’ll keep you posted.